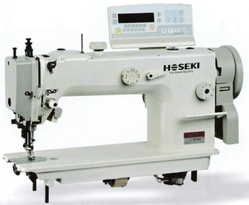 Taizhou Hoseki Technology Co. Ltd. Is a manufacturer which brought in advanced technology from japan, for producing high-tech Hoseki brand sewing equipment. 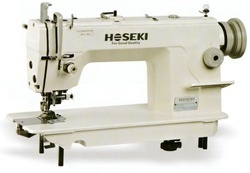 Hoseki pursues excellent quality and advanced technology as the goal, owning over 10 sewing machine experts from domestics and overseas. A joint venture r&d center with famous Japanese companies. Hoseki sticks to customer-oriented, spares all effort to bring in new technology to the sewing machine field, focus on mechatronic machine, relied on good quality and faithful after-sale service to create value for customer. Hoseki will continue to carry forward the spirit of solidarity and innovation, devote to improving the quality in the future. 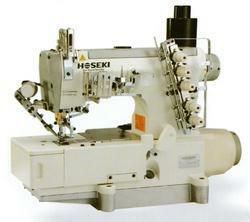 Making Hoseki to be a good and reliable sewing machine supplier in the worldwide market. This model adopted lockstitch machine structure and added edge cutter for shirt, suit specially for collar, the cutter can be adjusted. Edge cutter width optional : 1/8", 1/4", 3/16"
Application : Suitable for medium and heavy materials, such as underwear, jeans, coats corner sewing or decorative sewing. This series products adopted power saving direct drive motor and auto trimming function, low cost, high efficiency, high profit return. 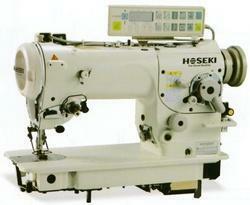 Usage : Sewing on different kinds of knitting-wear, under-clothes, beddings material from light duty to media-heavy duty. 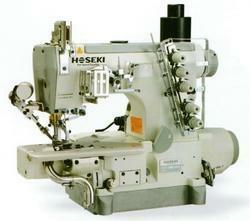 Origination in sewing machine industry. The industry's first energy-saving auto-trimmer. 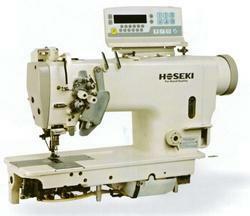 The machine adopts direct energy-saving motor, break out the traditional common sewing machine belt transmission way. Improve the transmission accuracy and the energy conservation, environmental protection, and has the automatic speed, automatic needle position function, realizes the low cost, high efficiency good ratio of mechanical and electrical machine products. This machine is flat bed interlock sewing machine, it is suitable for large area material sewing, it is also used for sewing decorative stitch on both sides and all kinds of decorative stitch. As the foundation type products, it can be equipped with extremely rich in all kinds of special device, which can meet all kinds of different processes and the specific process of sewing operation. For normal sewing and underwears. The machine with the trimmer for end of cloth and automatic suction device, one side selvage cut, one side sew, suitable for t-shirt, shirt and so on (medium thickness fabric) cylinder content the hemming of the creasing process. 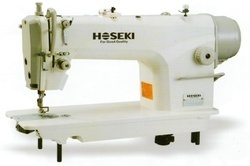 It can be used for t-shirt, leisure clothes and sportswear's bottom hemming, better for light to medium duty. Using direct drive motor with small servo control system, the machine responds quickly and stops accurately. Through the electronic controlled pendulum needle, standard equipped with straight line, 2 points, 3 points, 4 points, crescent shape, needle shape etc which are eight kinds of 350 sewing patterns. The operator can design pattern through simple change on the panel by adjusting needle swing range, needle base position, needle stitch amount etc. It's with automatic function like auto trimmer, auto reverse feeding and auto foot lifter (optional) which helps improve work efficiency. This machine adopts simple wiper device, which enables 2 points zigzag seam and 4 points zigzag seam easily without machine changing, thus improving the efficiency of sewing machine. By installing feeding device with height-changeable feeding dog, the machine can effectively prevent the side when sewing and the deviation when sewing on the flexible fabric. And the machine use none-rotating bobbin, thus avoiding no-loaded rotating and also keeping appropriate pulling strength of the bottom thread. Option device : Elastic attaching device. 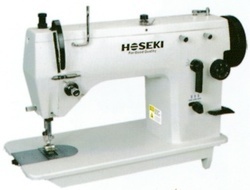 The machine head becomes longer and higher and the operating space is more spacious which makes it easy to put in and take out the sewing material with the increased presser foot height. With the dial adjustment device, the operator can adjust the presser foot differential easily, the adjustment between inner and outer presser foot is 2-5.5mm which improves the sewing quality. 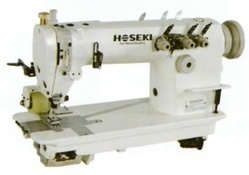 The stitch dial is with locking device, it ensures the stitch length remain stable while back feeding. Gear pump is with automatic lubrication system, it ensures the machine is sufficiently lubricated while running at low speed. 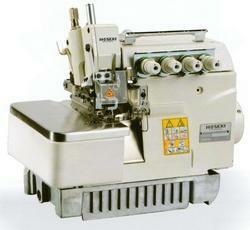 The stitch length 9mm makes the machine widely used. This series machine is with automatic needle positioning, auto-trimmer, back feeding, presser foot lifter (optional) function. 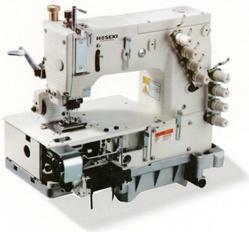 4 needle cylinder bed machine for t-shirt placket front.